My Diet Coke still tastes like pool water. There is this thing called bleach dyeing that is all the rage. Or, at least it was all the rage. I’m not sure where it is in the current trend cycle, but when I woke up early Saturday morning with a desperate need for patterned curtains in my living room, it was a means to an end. 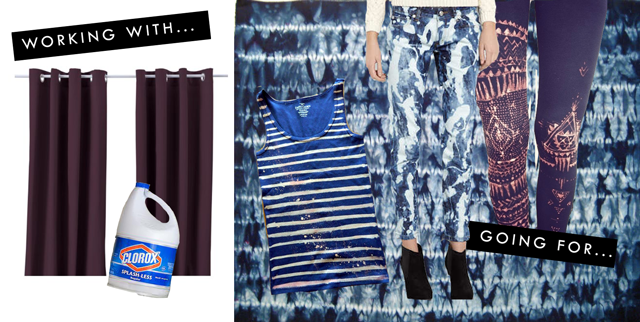 Have you seen bleach dyeing? It sorta looks like that time your mom spilled bleach on your favorite black sweatshirt, but this time it’s on purpose. Some people splatter it on their jeans, some people draw it on with a bleach pen, and some people take a reverse-tie-dye approach – that was me. I had two sets of dark eggplant-colored curtains from Ikea. Totally free to me, leftover from a friend’s former apartment (it pays to be a hoarder!). Nice and thick. 100% cotton, too. Perfect for bleaching, right? They smell awful. Even after two rounds in the washing machine they can’t come inside. I had to sling them over the back banister just to take this crappy photo. I’m sure the neighbors see this and think I killed someone. To top it all off, in this glorious process, I think I gave myself a mild case of chlorine poisoning. Awesome. No, for real: I seriously doubt anyone will try this based on my review here, but if you do, do this OUTSIDE ONLY. Working in a sink under an open window with a fan and gloves is not enough. Sooooo not enough. My Diet Coke still tastes like pool water. And if that isn’t a cautionary tale, I don’t know what is. Woe is the tale of patterned curtain seeker! 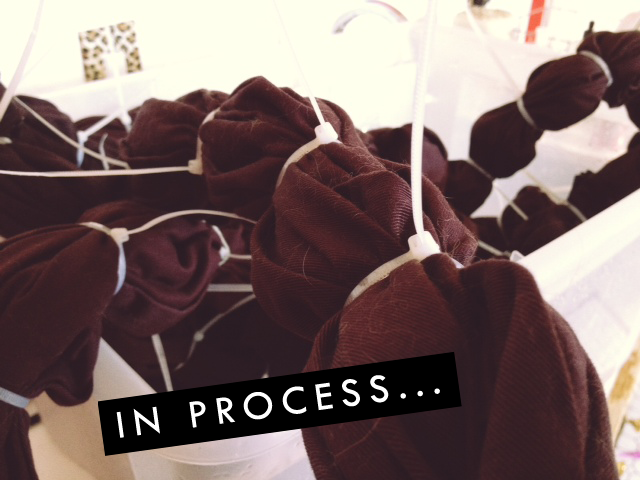 To see a more successful bleach dyeing endeavor, click here. Yipes. You could always put them on ebay. I am sure there is someone on the internet who has been searching for the perfect Kill Room Chic window treatments. That’s it. Kill room Chic! I’ve always seen people bleach patterning with diluted bleach, did you use it full strength? EEP! No. Three parts water to one part bleach. Most recommend 50/50 but my test patch was so severe that I thought I’d cut it down even more. So much for testing! I got chlorine poisoning when I reverse tie dyed one my husband’s Dickies shirt and it started off black and now it is like purple-ish grey. Not sure what happened because every other black shirt I did turned orange/red/brown/cream. Weird. And yeah I even did it 3 parts water and one part bleach and I have done it before with no illness. Going to try dying over top now? My friends and I did this to a bunch of pairs of jeans in high school. It worked great, but there was zero uniformity. Everyone’s jeans came out totally different. Any diet drink always tastes like chlorine to me. So good I know that if I ever decide to do this I will do it outside so when I poison myself the neighbors will be able to rescue me. And yes, the curtains are gas-ly and can’t even be used for picnic blankets. Good to know that someone as talented as you can have failures. OMFG!!!!!!!!!!!! I can’t believe how differently the each turned out. But your descriptions of them are hilarious. Poor angel! Let us know when you can drink Diet Coke again, I hope you feel better. Blehhh. Those curtains were obviously POSSESSED – no other explanation for that mess. Maybe the bleach cleared out your sinuses because Diet Coke always has tasted like pool water – more like someone pissed in the pool water! Your curtain experiment was worth a try – can you use them as drop cloths for future projects? Yes, I was thinking the red/yellow would make for excellent drop cloths! Well, you can look on this experiment as a case of “I did it so you don’t have to”. Public service. I know you’re always about that. I love Jessica Hill’s comment and use them for a zombie Halloween party. I hope you’re letting your place air out too. What a time to be doing this, 87 in the city over the weekend. I’ve got some garlic mustard at my place in need of killing. I’ll bet these would do a great job. yeah, they definitely look like a prop from the movie Psycho. but good job experimenting. Maybe your zip ties needed to be tighter. You can use pliers to grasp them if your fingers slip too much when trying to get them reeeeeally tight. Alexa (Swelldesigner — the tie dye queen) — gave me some good advice on that beforehand — I actually yanked on the zipties with pliers first. I think this fabric is just extra fibrous or something — the liquid traveled much faster than I would expect. Osmosis in action! There is a reason why this is an ancient Japanese craft. Some times they put little beans or rocks in a bunch to get a circle. Throw them away! They will probably continue to off-gas for years. 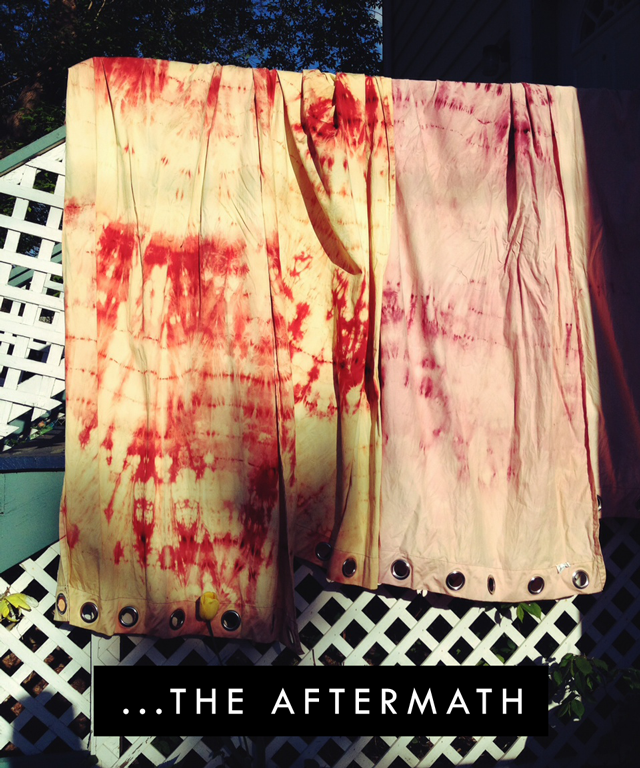 Even if you use them for a picnic blanket, someone might get dye on their clothes. Craft Fail. Fabric also has protective rinses on it. When I bought rolls of fabric to be printed at a mill, I had to buy some that was dye ready, or had no coating. I once thought I could macrame a curtain for a picture window. What was I thinking. Ummm, perhaps Hallowe’en decorations? I once thought I could hook a rug based on a blue willow plate. Yeah. That totally worked out. i’d vinegar those puppies and re-dye them. Holy moly! Thanks for sharing. Sometimes I take my craftfails way too seriously. Knowing this kind of thing happens to other folks makes me feel better! MaryK.